Some photographs from the match against Lord Sackville’s team on the Vine. 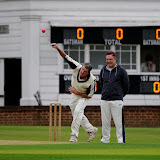 Mr Saker opened the bowling from the pavilion end. Please look out for any coaching tips. The Vine is not only famous for the introduction of the 3rd stump, but now for the first match played with the covers still over the 1st XI’s weekend wicket.